Noble Middle School players Trent Hufham, Aliam Appler and Luke Nixon at the Jan. 6 Carolina Bowl in Durham, N.C.
As part of his appearance in the Carolina Bowl all-star game, Noble Junior High School quarterback Aliam Appler raised $3,552 for “Kids helping Kids” St. Jude Children’s Cancer Research Hospital. Sizable donations came in from Jimmy’s at Red Dogs, Parker Construction and The Law Firm of Daniel Pleasant Hollomon LLP. Several family members, friends, teachers and local residents donated as well. 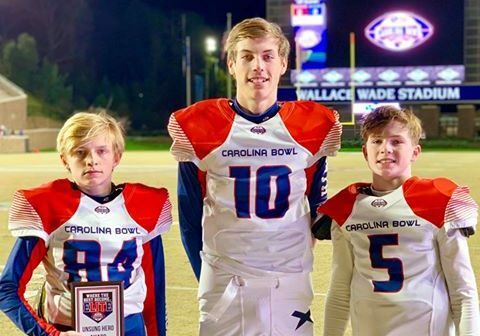 Though the 8th grade Team North Carolina lost to Team South Carolina, Appler won the Carolina Bowl Student Citizen of the Year Award, while his fellow QB Austin Havens won the Carolina Bowl Student Athlete of the Year Award. 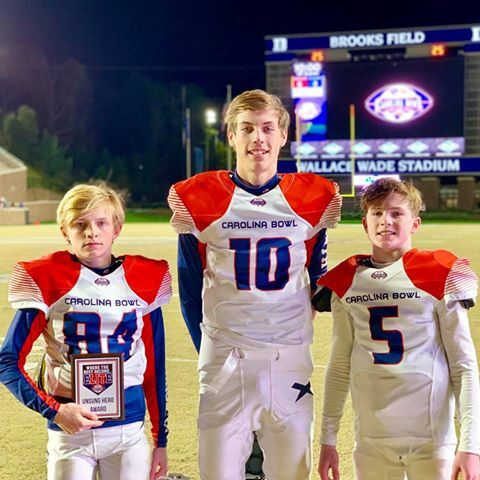 The MCS Noble Eagles Football team was represented by four Athletes: 7th grade corner/safety Mason Shand, and 8th grade quarterback Appler, receiver Luke Nixon and cornerback Trent Hufham, who also won the Carolina Bowl “Unsung Hero” Award for his performance during the game. Also represented from Wilmington, Coastal Cowboys Pop Warner Football 7th grade Jace Maier, 6th grade Mason Wiseman, 5th Grade Kellum Brown and Talen Maier.